Is it possible to run an environmentally friendly boat company? What is possible is to run a company as responsibly as possible. There are some obvious things to think about: fuel usage, potential wildlife disturbance, recycling, the environmental cost of producing the raw materials to make boats and engines and the positive impact of getting close to nature, where the natural world speaks for itself. Our boat has a jet, not propellers, which is an obvious and significant benefit to wildlife, and the inboard engine uses considerably less fuel than outboards do for similar sized RIBs. The hull is aluminum so doesn’t need to be replaced every few years as is normal practice for fibreglass hulls and it can ultimately be recycled. It’s always come pretty naturally to us to reuse and recycle and anyone who loves wildlife as much as we do will want to do everything they can to minimise disturbance and to help wildlife out whenever possible, be it by removing marine litter or by rescuing birds and animals in difficulty. Every Autumn we take an RSPB team out to Grassholm to rescue gannets. 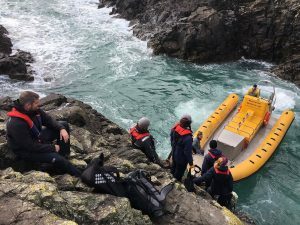 Grassholm’s craggy coastline isn’t the friendliest spot for landing so in all but easy conditions it requires a jet boat. Shaun started the rescue trips to Grassholm on his Ribworker jet boats and we continue them on ours. Fortunately Shearwater is rather good at this sort of thing :-). Photo right courtesy of Sky reporter Thomas Moore. All boat trips can clearly help to promote respect for the environment and wildlife in particular. 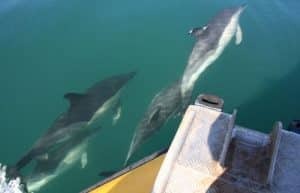 While our job is to give passengers an exciting and safe jet boat experience, the wildlife encounters are an important part of the experience for most people. Children and teenagers are not always enthused by the prospect of wildlife lectures but they’re keen to experience the jet manoeuvres and they then fall for the charms of the wildlife. We are very fortunate in Pembrokeshire to have clean seas but we pick up plastics, balloons, rope and fishing line and other waste in the sea when we come across it during trips and people naturally ask if it’s a problem for the wildlife. 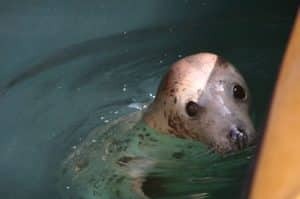 We were involved in the original consultative process in drawing up best practice guidelines for activities around seals, birds and cetaceans and we are accredited by the national WISE scheme for boat operators working around marine wildlife. We set up the business from the start to be as respectful as possible of the environment. Everything which can be recycled is recycled: paper, cardboard, plastic, glass, even aluminium 🙂 . We invited an external auditor to assess our plans and practices and on the basis of her findings we were awarded Level 2 Green Dragon accreditation. We are the only local boat operator to have achieved this. If our passengers’ reactions to the wildlife and our coastline are anything to go by then yes it’s possible to have fun and think about the environment too 🙂 .